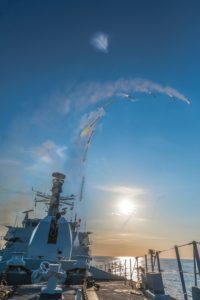 HMS Argyll, the first vessel to be fitted with MBDA’s Sea Ceptor, is alongside at DSEI 2017 – marking the world debut of the next generation air defence system. also the location for the formal launch of the Sea Ceptor User Group. Hosted by the Royal Navy, the two-day user group also includes the Royal New Zealand Navy and the Armada de Chile (Chilean Navy). The User Group has been devised to improve Sea Ceptor’s operational effectiveness through life and to deliver long-term reductions in the cost of ownership. It will enable users to share their experiences of introduction of the Sea Ceptor into service and employment and support of the operational systems, through a community of interest among the employing navies. Built around MBDA’s Common Anti-air Modular Missile (CAMM), Sea Ceptor is capable of protecting naval forces from the full range of current and future air threats, including the latest supersonic anti-ship missiles, small precision guided munitions and combat aircraft. In total six nations have already chosen the CAMM family to provide their future air defence capabilities in both the maritime and land domains. In British Army service the system is known as Land Ceptor – which is also making its debut at DSEI 2017 – while for the export market it is known as EMADS (Enhanced Modular Air Defence Solutions). By purchasing the same missile to meet the air defence needs of both the British Army and the Royal Navy, development costs are significantly reduced and both services are able to utilise a common stockpile that will significantly reduce procurement and support costs.